If you live on either coast or in the southern U.S., you may think of Wisconsin—if you think about the Midwest at all—as little more than flyover country or an ever frozen tundra. But for those who truly value a full spectrum of seasons, bucolic rural landscapes, and every iteration of self-propelled recreation, Wisconsin is where you go to enjoy the outdoors. Just ask anyone from Illinois. Wisconsinites have the tremendous fortune to live in a state whose natural beauty is easily accessible by foot. Trails abound, passing through vast tracts of forest reserves, to the tops of cliffs hundreds of feet high, through restored prairie, and historic districts in urban areas. In fact, some of the best paths are closest to the population centers of Milwaukee and Madison in the southern tier of the state. 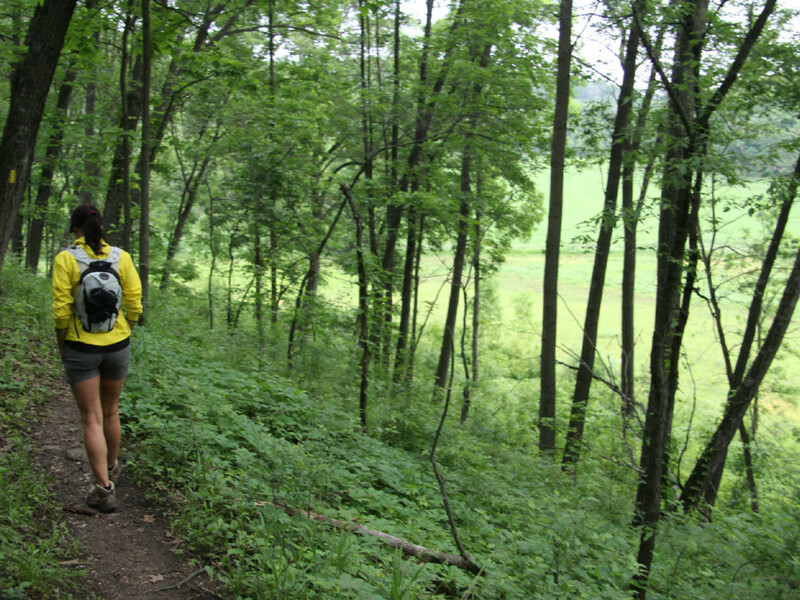 Hiking enthusiasts in Wisconsin have many favorite trails, but one or several segments of the Ice Age National Scenic Trail will inevitably top their lists. The Ice Age Trail traces the terminal moraine of the last glacier, from east to west and north to south. About half of the 1,200-mile corridor consists of hiking paths and multi-use trails marked with yellow blazes. The Ice Age Trail is an especially rich recreational vein when you realize that 60 percent of Wisconsin residents live within 20 miles of it—the only trail out of the 11 National Scenic Trails to be confined entirely within a single state. All this to explain why three of the 10 best Wisconsin hikes listed here are Ice Age Trail segments and one is a nationally designated connector to the IAT. The remaining six are not, which speaks to the high quality and quantity of trails to be found in the state. 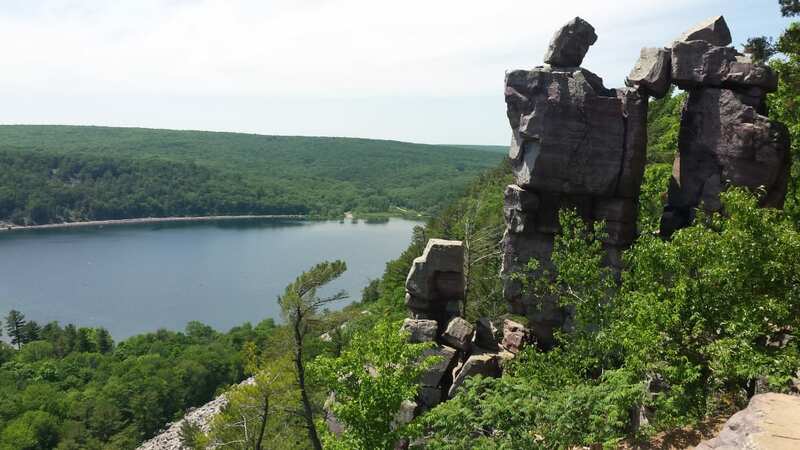 The most heavily trod and dramatic segment of the Ice Age Trail reaches the top of the 500-foot bluffs on either side of the 360-acre Devil’s Lake. Only a fraction of the one million annual visitors to Devil’s Lake State Park ever set foot on the steep steps leading to the magnificent views, but that’s enough to qualify these trails as the most popular in Wisconsin. Some 16,000 years ago, the last glacier deposited the Baraboo quartzite that blocks both ends of the Devil’s Lake gorge, leaving ice that eventually melted into the 40-foot-deep lake here today. Trails up to and atop the east and west bluffs lead to rock ledges and breathtaking views of the lake. Two branches of the Ice Age Trail, the Sauk Point and Merrimac segments, enter the park boundaries from the east through a couple miles of prairie and woodland. However, most folks start their hikes to the clifftops from the north or south shore of the lake itself. John and Ellen Morgan, in the second edition of their book 50 Hikes in Wisconsin, smartly advise starting at an adjunct trailhead parking area on County Highway DL, on the edge of the park, which also serves area mountain bike and cross-country ski trails. Park as suggested and you’ll avoid the larger but frequently full lots inside the park. 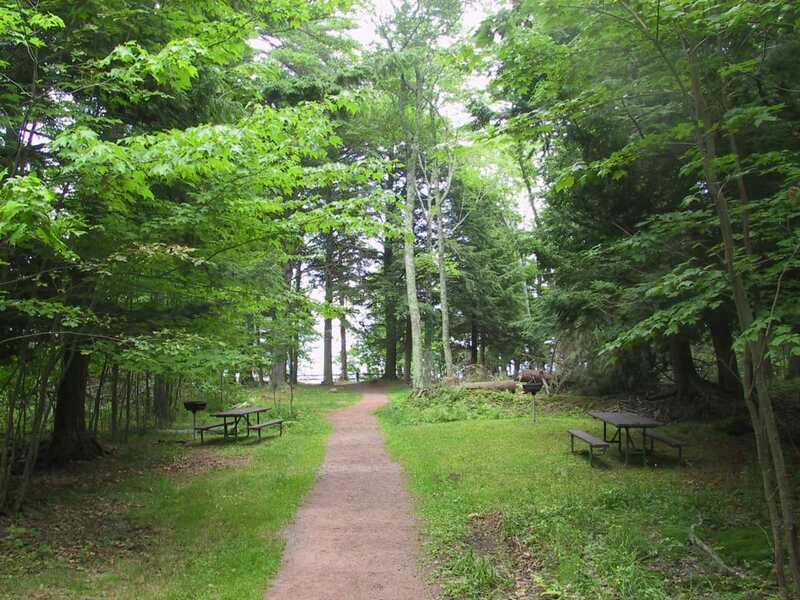 Devil’s Lake State Park is so popular, reserving any of the more than 400 campsites must be done months in advance. The trails can be packed, too. On Memorial Day Weekend, for instance, lines of tourists backup as they wait to take turns climbing and descending the steep and narrow rock steps. Some can be heard expressing regret for taking on the sometimes frightening and vertigo inducing scramble through the talus field with little to hold on to for balance. The route back down can be even more taxing. The knees take the brunt of the impact from dropping from one high step to another hundreds of times. 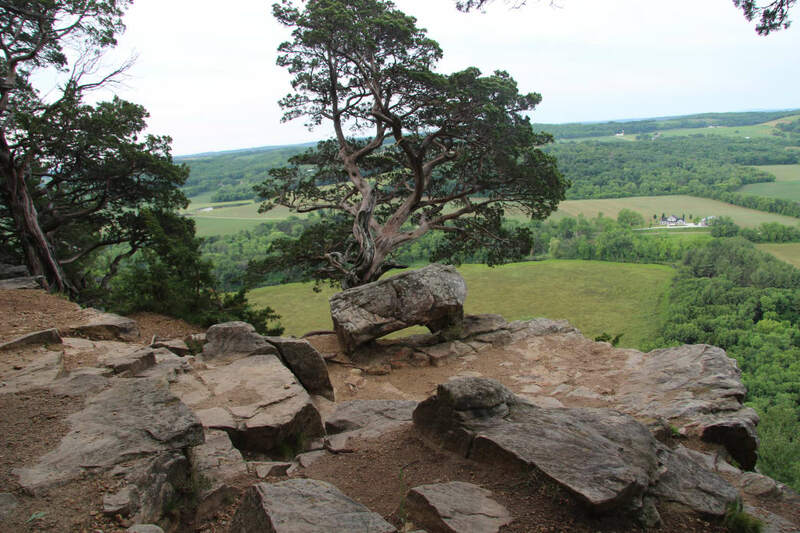 The Morgans recommend an excellent 7.5-mile, clockwise loop that takes in the East Bluff, including the hallmark features of Devil’s Doorway and Balanced Rock. Serious rock climbers tend to migrate to the West Bluff, where there are as many as 2,000 established climbing routes. Hikers, with hands on their knees and eyes set on the path beneath their feet, have ample time to appreciate these trails. A mind-blowing majority of the stonework—including the chiseling, moving, and setting of each massive stone—was done by hand and without motorized equipment more than 80 years ago by young men in the Civilian Conservation Corps and in keeping with National Park Service guidelines. “The CCC boys built no handrails, nor did they install rope lines or put in trail benches. They planted no shade trees as a respite for hikers. The primitive trail construction features were deliberate in an effort to create minimal impact on the land and also to make an exhilarating and self-rewarding experience for the hiker,” explains Robert J. Moore in his book Devil’s Lake, Wisconsin, and the Civilian Conservation Corps. Much of the trails on the bluffs are narrow strips of asphalt that guide hikers a safe distance from the cliff edges. Nevertheless, it’s easy to see how people have fallen, suffered serious injuries or worse. A handful of segments of the Ice Age Trail can be found near Lodi, a small community 23 miles north of Madison. 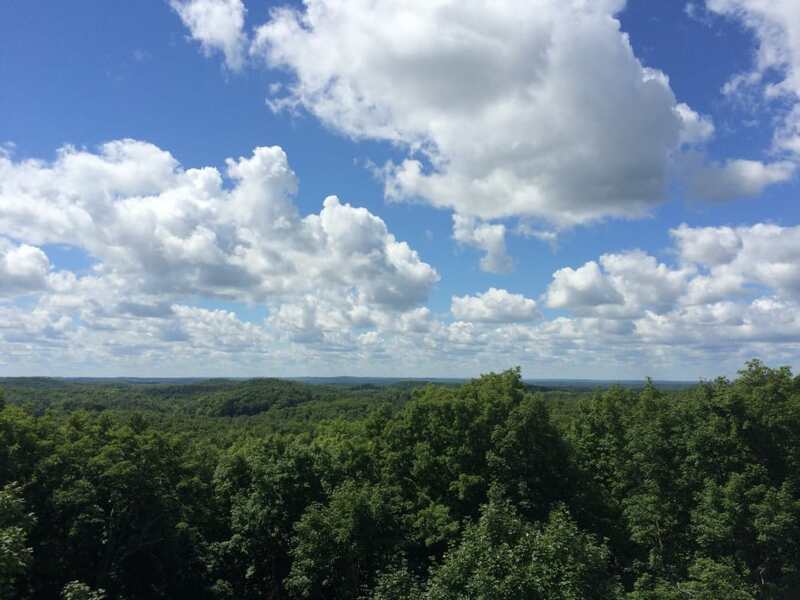 The local gem is a wooded climb to the cliffs of Gibraltar Rock and the expansive overlooks of the farmland and forest of the Wisconsin River Valley. The cliffs frame views that stretch to the Baraboo Hills and Lake Wisconsin to the north. Linking two parking lots, which are less than a mile apart on County Road V, is 2.8 miles of trail leading to the top and looping there, before coming back down. The trail through pine, red oak, and cedar curves up toward the 200-foot sandstone cliffs. Raptors frequently swoop and glide in the thermals off the cliff face. While no guardrails keep hikers from the edge, rock climbing is prohibited. Several hikers have fallen to their deaths here since Gibraltar Rock was designated a state natural area in 1969. That hike is enough for most folks. But to continue north on the Gibraltar Segment of the Ice Age Trail, it’s about a mile walk from the original parking lot on Park Road, up County Road V and Slack Road to the next trailhead. The following two miles is a more level mix of deciduous forest and prairie leading to Ferry Wayside Park. 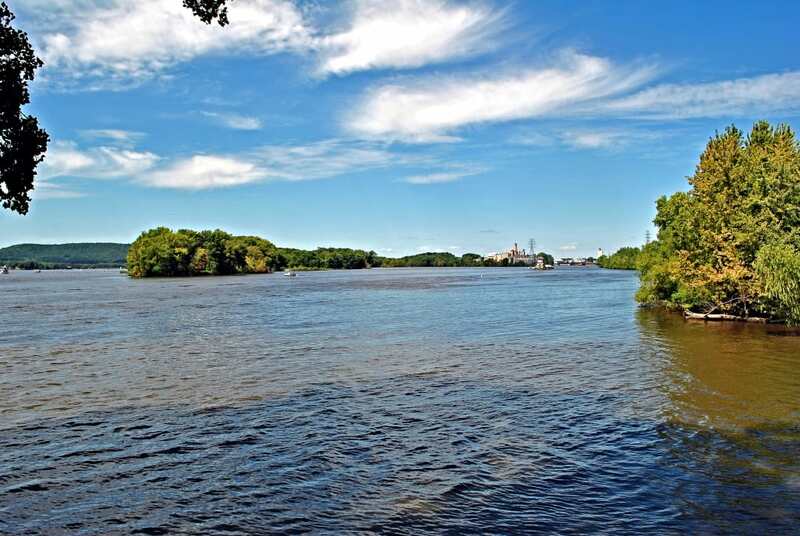 From there, the Merrimac Ferry smoothly and frequently takes cars, cyclists, and hikers across the convergence of the Wisconsin River and Lake Wisconsin to and from the small community of Merrimac. A two-mile road section precedes the 3.6-mile Merrimac Segment of the IAT that leads to Devil’s Lake State Park, described above. To reach the Gibraltar Rock trailhead from Lodi, drive four miles north on State Highway 113, a mile west on County Road V, then take a left on Park Road to the parking lot. The 22,000-acre Kettle Moraine State Forest - Southern Unit is 61 miles east of Madison and 37 miles southwest of Milwaukee, making it eminently accessible from the state’s largest population centers. At the northern end of the Southern Kettles is the Scuppernong Trail area. Hikers have a couple nice options here. They can either follow the 5.4-mile green loop popular among cross-country skiers when the snow flies, or hike the 5.6-mile, point-to-point intersecting Scuppernong Segment of the Ice Age Trail. For a ski trail, the outer Scuppernong loop is narrow, rocky, and sandy in spots, and is shaded by hardwood and pines for most of its course. It crosses the Ice Age Trail twice before reaching an overlook. Return on the orange loop to cut your hike to 4.2 miles. The Pine Woods Campground, complete with toilets and running water, serves as a good base for exploring the ski trail or the IAT—both of which offer gently rolling hills. On the latter, the vista from Spy Glass Hill is of a flat plain left after a glacial lake drained away. Scuppernong Creek and a trout pond still exist, fed by McKeawn Springs to which you can follow a trail spur. 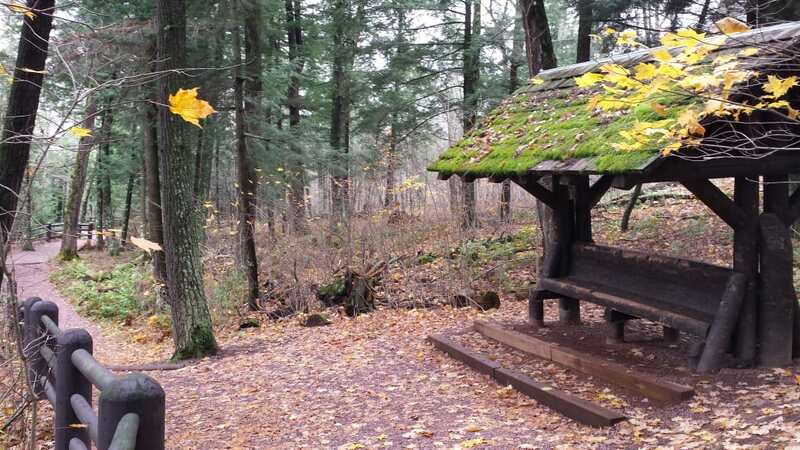 A beautiful 9.2-mile section of the North Country National Scenic Trail lies within the boundaries of Copper Falls State Park three miles north of Mellen, Wisconsin. Established in 1929, the park is replete with trail infrastructure built by the Civilian Conservation Corps during the Great Depression. The NCT follows the Bad River and showcases two waterfalls before it currently dead ends in the woods. Camp at the state park to give yourself time to hike the NCT and other trails there. The 1.8-mile Three Bridges Trail alone is a stunning walk through rocky nooks and canyons carved by a millennia of falling and churning water. From there it’s not far to Copper Falls, a 12-foot drop into rapids, and then Brownstone Falls, 30 feet above Tyler Forks which joins the Bad River. Pass the rocky chasm known as Devil’s Gate to the bridge over the Bad River and viewing platforms of the falls. The trail loops back to the main parking area. Just 20 miles north of the Wisconsin Dells, the state’s #1 tourist trap, lies the underdeveloped and underappreciated Quincy Bluff and Wetlands Natural Area . 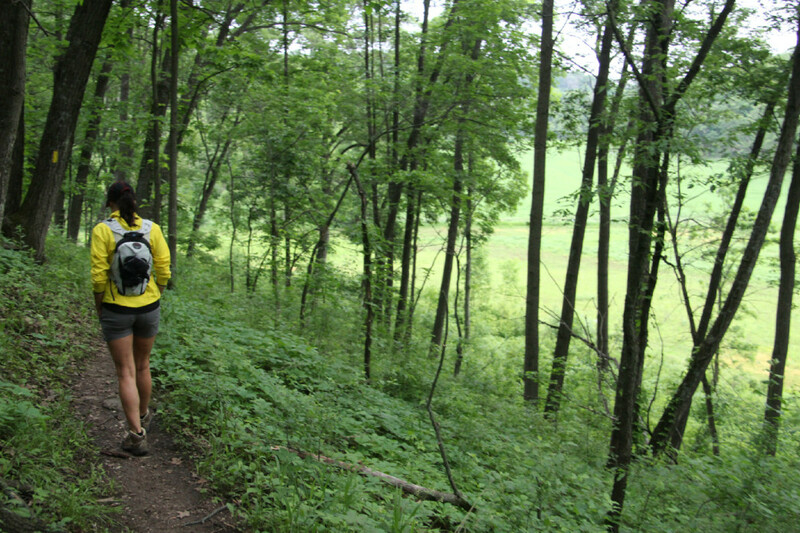 There, the Driftless Area mesa known as Lone Rock, is the 200-foot-high, two-mile-long destination for hikers. Although flat, the two-track logging road is a 9-mile round trip through a wild area sans amenities. You’re as likely to see a wolf or bobcat than another hiker here. And from the top of Lone Rock, where rock climbing is prohibited, no trace of human habitation can be seen amidst the wooded ridges and wetlands in any direction. Quincy Bluff is unique in that it includes both oak and pine barrens. The 6,600-acre state property was designated a state natural area in 1993. 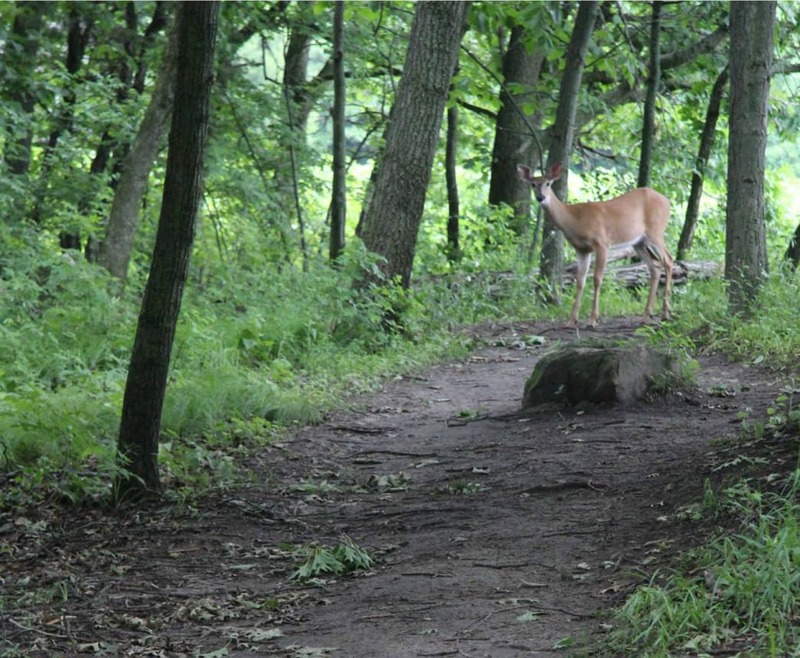 In 2013, the Nature Conservancy donated its remaining 1,700 acres of Quincy Bluff and set up a permanent endowment for management of the preserve. A respite from urban and campus life is the University of Wisconsin-Madison Arboretum . 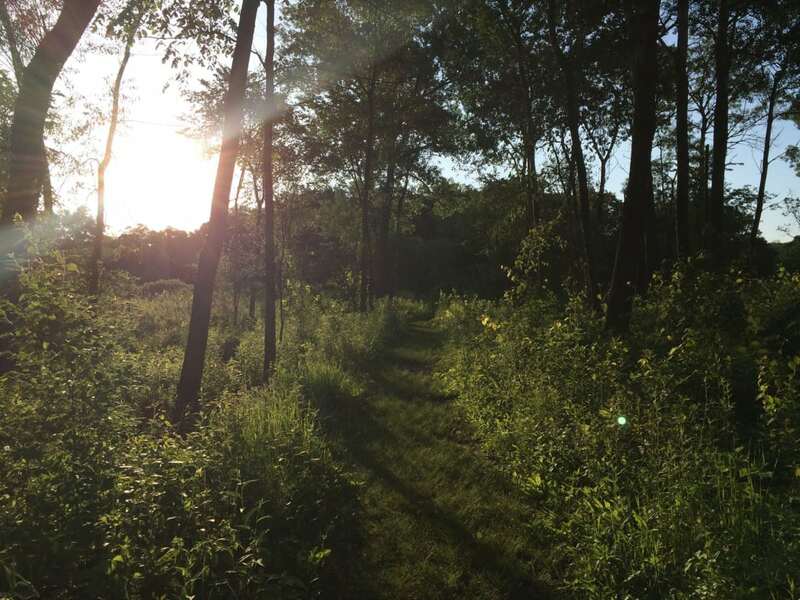 Treasured by Madison residents, “The Arb” is 1,200 acres of restored prairie, forest and wetlands in the heart of the city. Once farmland, much of the 1,200 acres was purchased during the Great Depression and continues to be the site of ecological restoration and research. A web of some 20 miles of hiking and Nordic skiing trails thread through the Arb, but three trails in particular showcase the tall grass prairie, savannas, and various forest types best. First, the southernmost Green Prairie is explored via a packed dirt trail covered in pine needles. Here the high-speed traffic on the Beltline Highway, which runs parallel to the trail, is out of sight but not out of earshot. Otherwise the 2.6-mile loop feels remote, even where it borders a residential neighborhood. The pines give way to oaks and other deciduous forest before winding down to the Grady Oak Savanna, some open prairie, and wetter areas. You have the option to leave the Greene Prairie Trail through a tunnel under the Beltline and hook up with 2.4-mile Wingra Woods loop in the central portion of the Arb. This area has it’s own trailhead across from the entrance to Longenecker Gardens. A 400-foot boardwalk skims the surface of a marshy area and provides a glimpse of Lake Wingra. Through Gallistrel Woods and Lost City Forest can be found some of the most secluded (and wet) areas best for observing wildlife. A variety of birds can be watched in the Teal Pond Wetlands. At the southernmost point, hikers can return the Green Prairie via the tunnel. The multiuse Wingra Marsh Trail is a 1.6-mile, out-and-back, along the edge of the park, connecting Marion Dunn Marsh along Monroe Street to the No Hee Um Pond On Arbor Drive. Waterfowl and even deer can be seen here. One of Wisconsin’s premier urban trails is the Hank Aaron State Trail , a 12-mile stretch of paths and streets connecting the Milwaukee lakefront to the city’s west side—and a dozen major of the top revenue-generating venues along the way. That includes Discovery World, the Milwaukee Art Museum, the Summerfest grounds, Harley-Davidson Museum, Potawatomi Casino, Mitchell Park Domes, Miller Park (where the Milwaukee Brewers play ball), State Fair Park, and the Petit Ice Center. One of the more fascinating stops for walkers is the 90-acre Milwaukee Soldiers Home, a national historic landmark, just west of Miller Park and north of the Clement J. Zablocki Veterans Administration Medical Center. The Historic Soldiers Home, consisting of several buildings, dates back to 1865 when President Abraham Lincoln—a month before he was assassinated—signed legislation establishing the National Home for Disabled Soldiers. Two years later, the Milwaukee Soldiers Home opened as one of just three homes for returning Cilvil War soldiers. Standing closest to the trail is the Ward Memorial Theater, where the likes of Bob Hope, Will Rogers, and Liberace entertained soldiers. Built in 1881, the building once included a ticket window for the railroad line that ran the route the Hank Aaron Trail follows today. While the Bureau of Veterans Affairs oversees and operates out of some of the buildings, some of the structures remain vacant and not open to the public—including the theater, chapel, and main building. However, a walking tour app is available for people to tour Soldiers Home on their own. The app includes descriptions, histories, and an interactive map for 27 stops for self guided tours. The Milwaukee Soldiers Home Historic District is accessible via Zablocki Drive off I-94 near Miller Park. The Hank Aaron Trail is linked to Milwaukee County's 100-mile Oak Leaf Trail and several other trails, allowing cyclists to pedal from Lake Michigan to well west of Madison. Madeline Island is the largest and southernmost island of the Apostle islands of Lake Superior and the only one open to commercial development. Sharing the beauty but not the remoteness of the other islands in the chain which constitutes the Apostle Islands National Lakeshore (not including Madeline Island) is Big Bay State Park . The 2,350-acre park is a few miles outside La Pointe, the tourism center of Madeline Island, and is home to many nesting bald eagles. Nine miles of hiking trails bring visitors—and anyone staying in its 60 campsites—to a 1.5-mile-long beach and a large enclosed lagoon. Also on the island is the 2,600-acre Madeline Island Wilderness Preserve, minimally improved forestland open to hikers, berry pickers, bird watchers, skiers, and snowshoers. The northern trails are primitive, but the trails to the south of the property are wider and more level. It’s best to supplement your Madeline Island hiking with biking and kayaking trips to explore the coastline, cliff faces, and underwater caves. 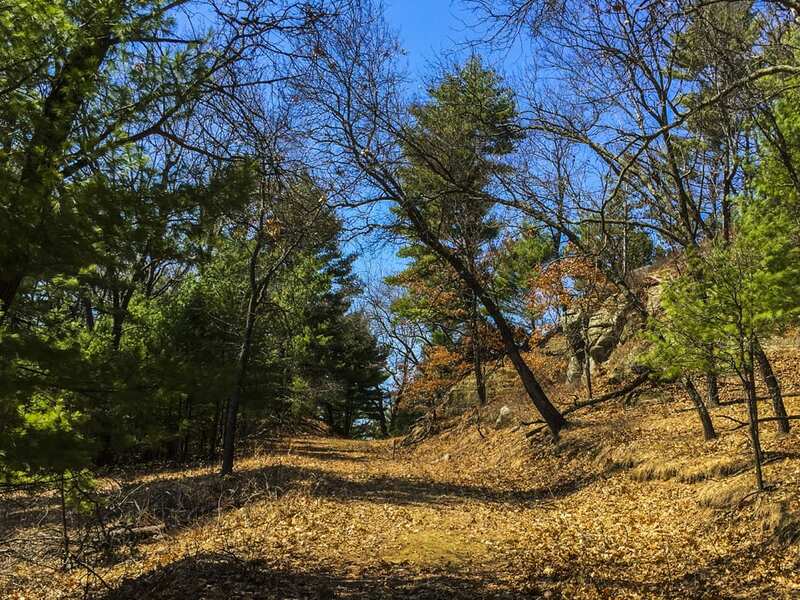 The Hixon Forest on the eastern edge of La Crosse in west-central Wisconsin boasts 10 miles of hiking and multi-use trails as well as access to other city parks, including Myrick, Riverside, and Grandad Bluff parks. 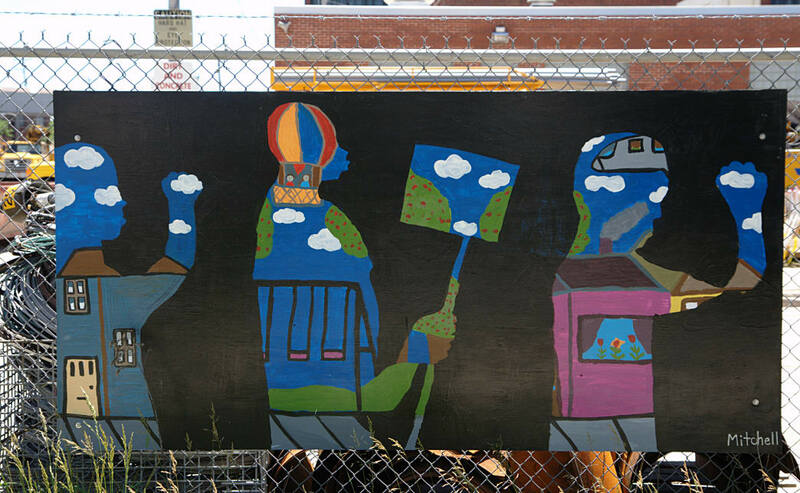 The latter is popular for its multiple overlooks of the city and the Mississippi River Valley. All the trails were built by Human Powered Trails, Inc., since its founding in 1999. HPT recently expanded its scope and renamed itself the Outdoor Recreation Alliance to support silent sport recreation in the "seven rivers region" of western Wisconsin, northeast Iowa, and southeast Minnesota. While the original organization was best known for construction and promotion of mountain bike singletrack in the La Crosse area, the new entity is promoting the area for hiking, trail running, bird watching, kayaking, sailing, cross-country skiing, and fishing, too. Timm’s Hill, at the high point in Wisconsin (1,951 feet above sea level) yet a low-profile trail, is found near the tiny town of Ogema in the central part of the state. It also has the distinction of being one of only two National Connecting and Side Trails. The 10-mile Timm’s Hill Trail earned that designation in 1990 by linking the Ice Age Trail to Wisconsin's highest point. The trail from the top leads 10 miles south, where it connects to the Ice Age Trail’s Rib Lake Segment of of 5.8 miles and the Rib Lake Ski and Snowmobile Club’s 30K trail system. On Timm’s Hill stands a 45-foot tower that grants panoramic views of the tree canopy. Timm’s Hill is the centerpiece of a 220-acre county park by the same name. Written by Joel Patenaude for RootsRated.